Hits Just Keep On Coming! 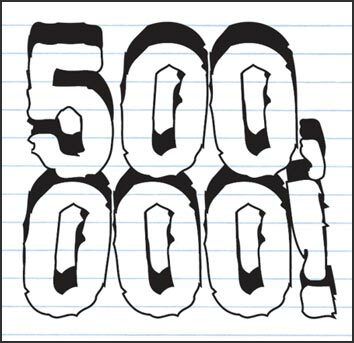 Forgive this personal digression, but I just noticed that United Methodeviations passed the 500,000 page views milestone recently. On the one hand, this boggles my mind. I realize that many hits come from “regulars” who check in frequently, so I have no delusions of reaching half a million people. I also know that many people “accidently” visit looking for graphics or hitting the wrong button. Still and all, a bunch of people have visited the site and engaged the materials I post here. That’s so cool. I mean, I write the blog as a way of thinking out loud and journalling. Much of what is here is nothing more than me processing what I think and why. I do not kid myself that this is cutting edge thinking, nor do I really think other people “need” to know my thoughts. But I do love engaging in dialog and exploring ideas. I don’t always like people’s responses; they don’t always like or agree with what I post. Yet, we have a forum that enables us to have a conversation, to agree and disagree, and for the most part it is civil. The church (and the world) need safe places to negotiate our differences and to seek ways to build bridges and celebrate our commonalities. I often receive criticism for “being negative,” and there are times when this is well-deserved. However, I also get criticized for unrealistically asking people to stay focused on the positive and not always obsess about what we lack, what we aren’t, what we don’t do, and what we can’t do. I have developed a reputation as a cynically optimistic negatively positive critical thinker. I can live with this. In the past year and a half, the question I have been asked at least once a week is “Why aren’t you still working for the General Board of Discipleship (or another national Board or Agency)?” I have no idea — you have to ask them that — but it hasn’t really made any difference. I am still connected to Methodists/United Methodists around the planet, and instead of writing books and leading workshops I am writing this blog and preaching and teaching in a smaller market. I could not be happier than to lend my gifts and talents to the Wisconsin Annual Conference. While not a proponent of determinism, I do believe that wherever I am is where I am supposed to be (and whoever is in the conversation is exactly the right person to be there) so I grow where I am planted… and currently I am planted in very fertile soil. And so I keep thinking out loud, and I am stunned and deeply grateful to all who read, find value, are challenged and provoked, respond (in friendly, civil ways), and forge a digital relationship with me. The health and well-being of our church depends on open, honest, sometimes painful conversation. Thank you for having one with me. Please keep it up. Hmmmm … someone seems to be enamored with growing numbers and getting bigger all the sudden. When are you putting a coffee bar in the lobby? And is there a gift shop to visit? I read so much about our church from so many sources, but few things make me think more than yours. I don’t always agree with you, but I almost always find value in the topics you choose and the questions you raise. I have attended seminars you have led and they are always excellent and worthwhile no matter the subject matter. I have read your books and there is always something new and different in each one. I am very happy that you continue to write and to challenge us. I hope your readership continues to grow and that you hit 1,000,000 next week. Congratulations, but I still don’t understand what a “cynically optimistic negatively positive critical thinker” is.